Order large quantities of the nanobugs temporary tattoos to use as a novel incentive for promoting compliance with healthy behaviors like hand hygiene or getting a flu shot or as a reward for attending health fairs educational programs or classes. The tattoos are non-toxic and made in the USA. We recommend that they be applied to the inside of the forearm where they will last for about 10 -14 days (about the time it takes to make antibodies to the flu vaccine). Choose from the 12 different nanobugs characters offered or contact us directly if you have a special selection. 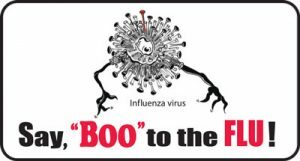 Say, “Boo” to the Flu!